I thought this photo perfectly illustrated one of the many reasons why it pays to use a property finder out here, especially if you don’t have the time or money to make endless trips to France to view properties which look perfect in the photos but then turn out to be very disappointing in reality. 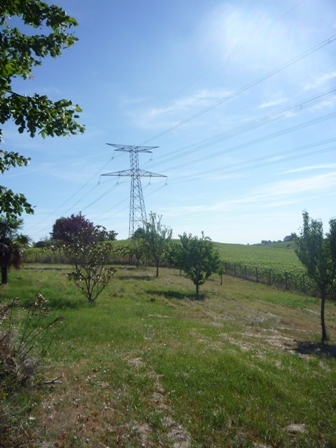 Of course, I am sure that there are plenty of people who wouldn’t mind living under a high voltage power line – I have even seen new houses built right underneath so that you can hear the hum of the electricity passing overhead. 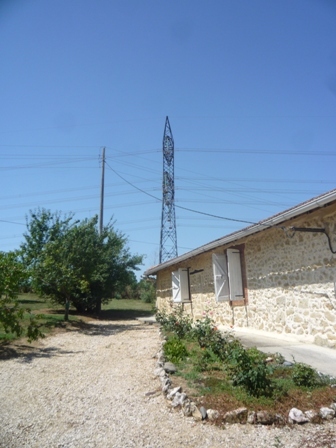 Others may be happy to have a huge pylon as a feature in the middle of their garden. But I know from experience that the majority of people moving to France are looking for a better quality of life and a healthier lifestyle and there is no way that I would ever recommend a house in this particular type of ‘hot-spot’ for any of my clients. Hence the 90 minute round trip to view this property was a complete waste of time. But at least it was my time, not my clients’ and this is, after all, my job. Although these wasted viewings are very frustrating they are a large part of the search; the process of sorting the wheat from the chaff and making sure that I have seen every apparently suitable house for sale before drawing up a short-list of the very best properties on the market that match budget and brief. It is a time-consuming and frustrating process but also immensely satisfying when I know that I have found the ‘one’.